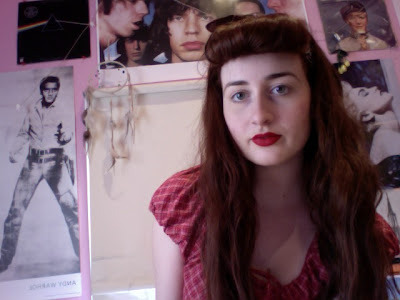 I'm going to a 1950's party on the weekend and I had it in my head that I must do a pin-up hair style. So instead of writing my Art History presentation that is due next Tuesday, I practiced doing my hair. I learnt how to do the fringe roll and other things from videos on YouTube made by cool girls who are really good at doing hair. So I was thinking about how great it was that YouTube could show me how to do things like that. Then I got more distracted by watching clips of 50s girl bands among other things like Elvis and Buddy Holly. I was thinking about how YouTube is kind of like time travel. You can access any period of time in almost the entire 20th century right up until this second. It's kind of this weird means of connecting past time and places with the present. I love it! As do most humans with internet access which was, when I last checked, about 1,407,724,920 people.